New Orleans is known as one of America’s most haunted cities, owing to its above-ground cemeteries (or “cities of the dead”) and a heritage rich in voodoo, vampires, and sordid tales. It’s a prime place to fraternize with the paranormal. Here are your options for haunted history and cemetery tours. From the Garden District to the French Quarter, many of New Orleans’ most famous residents are of the spirit sort. Hear the histories of the city’s ghosts and famous hauntings on a guided after-dark tour through the city’s historic neighborhoods. 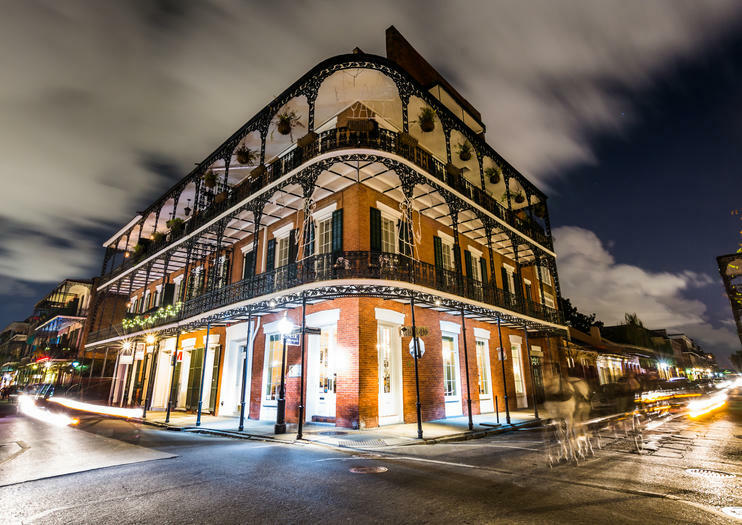 New Orleans ghost tours stop at sites with rumored ghostly activity, including historic haunted houses such as the LaLaurie Mansion and Lafayette Cemetery, the oldest cemetery in the city. New Orleans received an influx of Haitian émigrés during the Haitian Revolution, which ended in 1804, and Haitian culture, including voodoo religion, came along with them. Dig deeper into the voodoo culture of the Big Easy on a city tour with a local guide. Wander the maze of mausoleums at the supposedly haunted St. Louis Cemetery No. 1 to pay your respects at the resting place of Marie Laveau, NOLA’s most famous voodoo queen, and stop at a voodoo shop selling specialty items. It’s no coincidence that Anne Rice set her famous novel series, The Vampire Chronicles, here—vampire stories practically rise up from the above-ground cemeteries and cracked courtyards of New Orleans. Discover all of NOLA’s most legendary vampire haunts during an evening walking tour through the lamplit French Quarter to visit Interview with a Vampire filming locations and the St. Germain House (the former home of a rumored New Orleans vampire), while listening to spooky stories from local public archives and police reports. Hear about New Orleans’ ghouls and ghosts on a 2-hour walking tour of the French Quarter’s most haunted sites. See the city light up after dark as you follow the footsteps of infamous murders and star-crossed lovers, and hear their stories of misfortune, passion and betrayal. Learn why some locals believe this is America’s most haunted city, and visit the sites where paranormal experts believe they’ve documented otherworldly activity. Decide for yourself whether it's truth or legend as you explore the hidden side of the Vieux Carre.